Community Food Rescue (CFR) celebrated its third year by expanding our capacity to Feed More and Waste Less by cooking with recovered food. 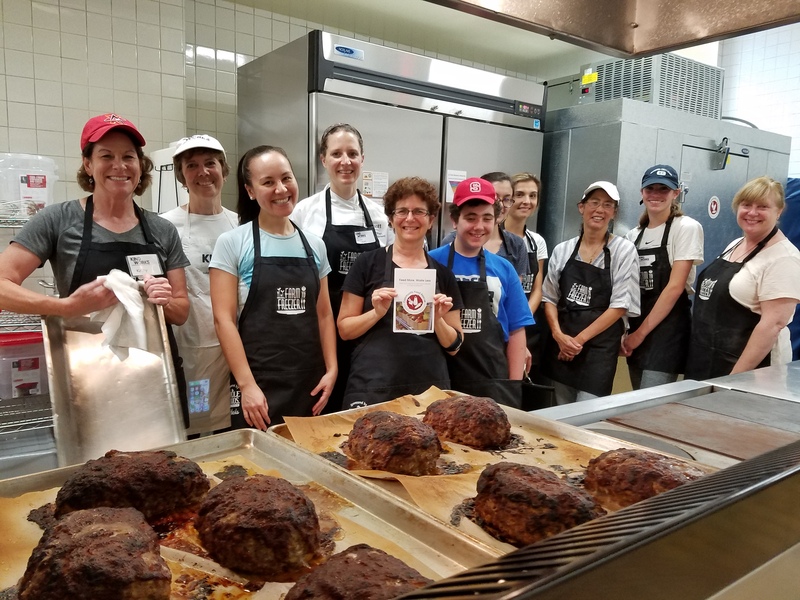 Thanks to a wonderful partnership with the Silver Spring United Methodist Church, Manna Food Center manages the newly-refurbished commercial kitchen as the churches’ mission-driven service to the community. The kitchen provides an expanded opportunity for Community Food Rescue, a program of Manna Food Center, to turn fresh produce some of which is bruised, wilted, misshapen, surplus or otherwise is unsold, along with pantry staples and meat into cooked meals. 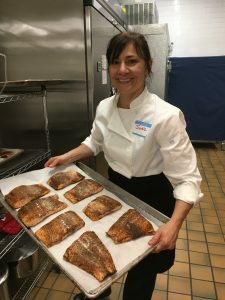 Chef Jodie Steiner leads KindWorks volunteers in preparing rescued salmon. CFR has fantastic volunteer help in the kitchen. Marriott International staff generously provided their expertise in helping us open the kitchen. Their chefs volunteer their time leading cooking sessions. 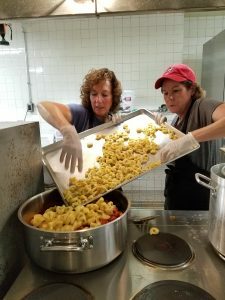 They are given a creative challenge of planning a menu with what’s donated a few days before a cooking event– ingredients from Manna’s warehouse of donated staples (eg: flour, rice, pasta, canned sauces, spices, etc. ), frozen meat, and donated produce from local farmer’s markets. It’s like TV’s Iron Chef and Chopped without the competitive edge. 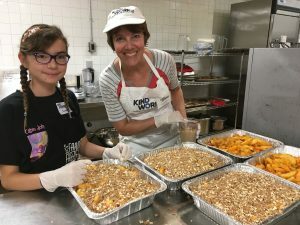 Guest chefs from Marriott International and other professional chefs lead three hour cooking sessions with 12-14 eager volunteers (adults and teens 13+ with adult supervision) from KindWorks, a non-profit organization that recruits and manages volunteers in many activities. So far, we’ve held five cooking sessions and delivered about 500 prepared meals to the Montgomery Coalition for the Homeless men’s shelter, Interfaith Works Women’s Center, and Catholic Charities Dorothy Day Place. A sampling of dishes include, penne with butternut squash sauce, blackened salmon with rice, Jambalaya, pasta with Bolognese sauce, fresh corn and cucumber salad, and peach cobbler. We pack food in aluminum pans that can be frozen and reheated in the same container. CFR will offer two cooking sessions during the upcoming Community Food Rescue Week Oct. 13-20th. Volunteers have already signed up to cook, but everyone is welcome to sign up and stop by and see the magic, chat about the process and pick up some cooking tips from the chefs. We’ll be posting additional cooking sessions through KindWorks later in the season. Manna staff also offer cooking and nutrition education classes at the Silver Spring United Methodist Church.